Shops not only displayed trees but sold them as well. One merchant reported selling 300 trees, all spruce, on Christmas Eve the year prior. Their price tags ranged from 50¢ to $5.00. The shopkeeper noted that customers favored spruce trees because their branches were stronger than those of hemlocks, another variety sold elsewhere for the season’s festivities. Although growers in the Norfolk area had initially supplied spruce trees to the store, that source had been exhausted. 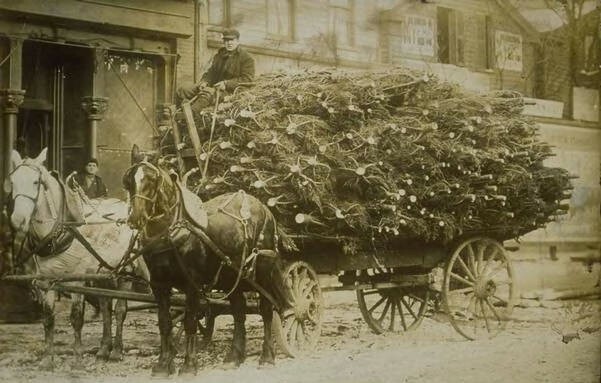 Orders now went to farms as far away as Sarasota Springs, New York, and Vermont, where dealers could purchase large enough quantities of spruce to meet demand. Still, local vendors were not out of the picture and had claimed a share of the estimated 1,000 spruce sold in Hartford that year. For Christmas day itself, Hartford residents who celebrated the holiday could choose from an array of activities, including church services, dinners, theatrical performances, dance parties, and even a polo match pitting Hartford’s team against that of Springfield, Massachusetts. And, in the day’s true spirit, charitable souls planned to bring a Christmas tree and gifts to children at the Hartford Orphan Asylum. Samuel L. Clemens Receives Scrap-book Patent – Who Knew?